Today in Culpeper County, Virginia, one of the last skirmishes of the Gettysburg Campaign — Confederate Gen. Robert E. Lee‘s invasion of the North, defeat at Gettysburg, and subsequent retreat — takes place. In Culpeper County, Virginia, Union cavalry cross the Rappahannock River and engages Confederate forces. The federals push the rebels towards Brandy Station and Culpeper, at which point Confederate reinforcements arrive and drive the Union cavalry back across the river. Few casualties result during this skirmish or during a second skirmish in the same area three days hence. Collectively, these military actions represent the formal end of the Gettysburg Campaign. As the Gettysburg Campaign comes to a close, Baptist church life advances in the North and West this day. In Rhode Island, Dr. Charles Edward Smith (1835-1929), recent graduate of Rochester Theological Seminary, is ordained in Rhode Island, after which he accepts the pastorate of the First Baptist Church of Pawtucket, serving as pastor from 1863-1868. Pastorates in Ohio, New York and Connecticut follow, as Smith becomes a well-known Baptist writer. Meanwhile, on the Western frontier the First Baptist Church of Golden, Colorado is established, and becomes the oldest existing Baptist church in the state. Yet further westward, the Salmon Creek Baptist Church (later renamed the Brush Prairie Baptist Church) is founded in Clark County, Washington near Vancouver. Among the six organizing members are two brothers (the reverends Alvin Clark and J. J. Clark) who are prominent citizens, the latter serving in the territorial legislature. 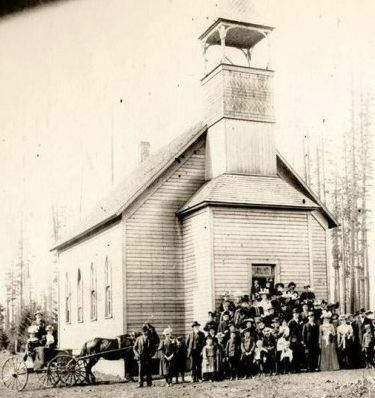 In 1865 the church establishes the state’s first Sunday School class. At some point the congregation adopts the then uncommon practice of feetwashing, but abandons the ordinance in 1881. It later becomes known as the oldest existing Baptist church in the state. The experiences of Baptists on the northern home front during the war, in short, are varied in both expression and geography. Far apart in many ways are the well-educated minister Smith and the pioneer church-planting reverends in Colorado and Washington, in addition to the membership and church practices of their respective congregations. Yet the Baptist threads of freedom of conscience, local church autonomy and commitment to biblical authority in faith and practice bind these diverse ministers and congregations together within the same faith family.